Learning is easy and fun with Wall Street English. It’s true! Where else can you learn English while watching a Hollywood quality learning TV series?! Read on to find out more. The Wall Street English TV series is a comedy about a group of people trying to make their dreams come true whilst living in New York. According to research across 17 countries, the most popular way learners first try to learn English is through using informal methods like watching English TV, YouTube or reading English newspapers (Morar English Learners Purchase Journey Research 2016). With the Wall Street English course students can learn by watching a fun and entertaining TV series where they can learn about different cultures and get familiar with a range of accents from around the world. It’s not only fun but it’s also effective. Learners then join small classes with qualified English teachers which help to make the Wall Street English method the best way to learn. Wall Street English is pleased to announce that one of the main actors from the WSE TV comedy is going to be visiting some of her fans on a tour of Wall Street English centers in Asia in March. Nicole Maxali plays the character ‘Khae’ who’s from Thailand, in her 20’s. Khae works for a large company but dreams of owning her own business where she designs products that makes the lives of all people better. Nicole will be visiting Wall Street English centers in South Korea, Hong Kong and China throughout March to give motivational workshops to English learners in the WSE centers. Nicole will utilize her expertise as a Motivational Speaker to inspire students and potential students to use WSE as a path to accomplishing their dreams. She’ll also be exploring some of the beautiful sights of Seoul, Hong Kong, Beijing and Shanghai. You can follow her Asian adventures on her Instagram account: nicolemaxali, the WSE Global account: wallstreetenglish_global and the hashtag #KhaeWSETour. 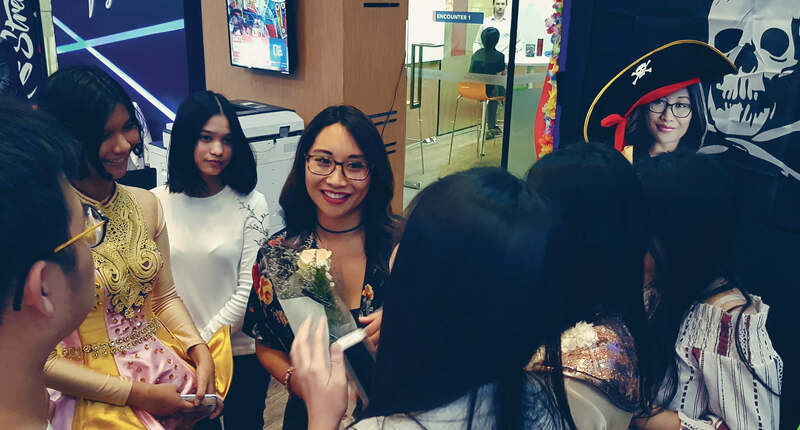 Nicole (Khae) has already visited WSE Thailand and Vietnam back in 2017 and was greeted as a famous celebrity! Find out more about Our English Courses and start learning now!